Drumsound & Bassline Smith are one of the most significant acts in drum ‘n’ bass. Their foundations were built in the very earliest days of rave, and their productions have never lost that pioneering spirit. Bridging the gap between the underground and mainstream, able to smash the biggest festival stages while still able to rinse it out for the aficionados, they’ve proven their status time and time again. And, now, they’ve got a a brand new album for us, “Wardance”. The first single, “Come With Me”, is already shutting down dances everywhere and stormed to the top of the DnB charts, so the follow-up comes loaded with anticipation. This time, we’re being treated to the LP’s title track, and it’s clear that Drumsound & Bassline Smith aren’t playing. “Wardance” opens in a dark, forbidding landscape of unsettling scythe-swings of synth-brass and dissonant pads. It all blatantly signifies approaching danger. As gritty, grimed-up orchestral stabs fill the atmosphere, and chest-crushing sledgehammer kick drums build, it’s time for ravers to find their space on the floor. We already know this one’s going to be weighty. The drop has Drumsound & Bassline Smith’s name written all over it. Whiplash strikes of kick and snare, supported by the rolling breaks that have always featured in their work, keep it moving. Insistently sustained waves of bassline, and those electric-charge modulations to mark out the ends of phrases, drive the energy onwards. This one’s going to be a deejay’s weapon of choice across the sub-genre divisions. Tech, rollers, jump-up, however a selector classifies themselves, they’re going to want this on their USB for when it’s rave-destruction time. 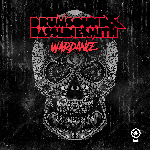 It might only be the second taste we’ve had of the “Wardance” album, but this release, combined with “Come With Me”, demonstrates that Drumsound & Bassline Smith are at the top of their game. Of course, there’s the scientific production technicality born of long years of experience, but that’s not all that’s on offer. These producers add an intimate understanding of how to bring vibes to a dancefloor. Essentially, these singles tell us that the album is going to be absolutely lethal.